Petsmart: FREE Royal Canin Selective Discovery Box! You can get a FREE Royal Canin Selective Discovery Box from Petsmart! Just go here and log in or register and then click on the “coupons” tab to get yours. FREE Wardley Fish Food w/ $2.00 Coupon! I just spotted this coupon again under zip code 20910! Do you have a pet fish? 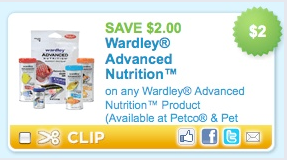 If so you will like the coupon just released, it’s for $2/1 Wardley Advanced Nutrition Product! I’ve seen the smaller packages at WalMart for $1.97 – so FREE after coupon! You can sort by “Pet Care” on the left hand side. If you have a dog or cat, or even a dog AND cat, then here’s a wonderful rebate offer! Through June 30th, 2011, you can get any 2lbs or larger IAMS dry dog food and/or any 1.8lbs or larger IAMS dry cat food for FREE after mail-in rebate. By June 30th, 2011, purchase one bag of IAMS dry dog food (2 lbs or larger) or purchase one bag of IAMS dry cat food (1.8 lbs or larger). Mail the completed rebate form, the original UPC from the package, the original sales receipt dated between 2/1/11 and 6/30/11 including the store name and product purchase circled and mail to address listed on the rebate form (keep in mind that the cat and dog rebates each go to a different address). * Limit one submission (of each rebate) per name, address or envelope. Allow 6-8 weeks for delivery. For the status of your rebate, call 1-866-572-0025. Each rebate is limited to the first 15,000 submissions. PetSmart: Greenie Dental Chews JUST $0.40 Each! Greenies Dental Chews are $0.79 (for a single one) at PetSmart so with the B1G1 coupon, you can get them for $0.40 each…..
Go here where you can get a FREE sample of Purina ONE beyOnd Dog or Cat Food! Go here to snag your doggy a FREE Sample of HealthiDent Dental Treats for Dogs! Go here and “Like” Pro Plan on Facebook and then click on the “Coupon” tab to get yourself a $5.00 off Pro Plan dog or cat food coupon! Petsmart: FREE Science Diet 4lb Bags of Dog Food! FREE Sample of Natural Nutrition Gourmet Cat Food! You can get a Free Sample of Natural Nutrition Gourmet Cat Food!